I see that big question mark in your eyes. &#160;&#160;&#160;Do I stay or go? &#160;&#160;&#160;Is he (or she) the right one for me? &#160;&#160;&#160;Should I buy this? Sell that? Start this? Stop that? Invest here? Commit there? I know a question that makes it easy to determine the answer to all these others. It&rsquo;s the question that answers just about everything for everybody, for the rest of our lives, and at every stage of our lives. It brings clarity and fresh insight for each decision we have to make. It pierces the fog of our self-deception and erases all those shades of gray that cloud our reasoning. It takes us beyond simple right and wrong, beyond what&rsquo;s merely legal, beyond the lowest common denominator. And if we&rsquo;re honest with ourselves, God will use this question in the deepest parts of our lives to help take us to the place of our fullest potential. Not only that, but it&rsquo;s a fairly easy question to answer. In most cases, you&rsquo;ll know the answer immediately. Your greatest regret could have been avoided had you asked this particular question and then acted on your conclusion. Regardless of whether it&rsquo;s an action or event you regret or an entire chapter of your life that you wish you could do over&mdash;had you evaluated your options through the lens of this powerful question, you would have avoided what may be your greatest ongoing source of pain. As you move through the pages that follow, you may find that this single question could have changed the trajectory of your entire life. It&rsquo;s a question I ask often every day. It&rsquo;s a question that guided me through my late twenties as a single man. It&rsquo;s a question that has served me well through twenty-six incredible years of marriage. It&rsquo;s a question I&rsquo;ve taught my three kids to ask about every option that comes their way. They absorbed it, because it&rsquo;s the lens through which we learned to evaluate every decision we made as a family. Over the past thirty years, I&rsquo;ve had the opportunity to teach this principle to thousands of middle school and high school students. Many of them are adults now with children of their own. Letters, e-mails, and conversations assure me that this big question continues to serve as a decision-making filter for scores of these young adults. This single question serves as a lens through which you can evaluate all your options. It&rsquo;s a filter that casts things in their actual light. It&rsquo;s a grid that provides context for every choice. It will provide you with a new perspective on your love life, your career, your finances, your family, your schedule&mdash;everything. It&rsquo;s a question that will shed light on issues the Bible doesn&rsquo;t specifically address. But it&rsquo;s not always an easy question to ask. Sometimes it can be a bit threatening, because it exposes so much about our hearts and our motives. But that&rsquo;s just one more reason it&rsquo;s so revolutionizing. In the first part, you&rsquo;ll be introduced to our big question. It takes me a couple of chapters to get to it, so be patient. The second part explores some common (and dangerous) alternatives to asking our big question. In the next two parts, we&rsquo;ll apply our question to two key areas of life: your time and your relationships. Then, in the fifth part, I&rsquo;ll let you in on a secret known by all the world&rsquo;s best decision makers. Finally, in the last part I&rsquo;ll challenge you to make a decision that allows you to get the maximum benefit from this question. The principle behind this valuable question has impacted my decisions&mdash;and consequently my life&mdash;more than any other. This is more than another book for me. This is a life message. The content isn&rsquo;t simply pulled from a series of sermons; it&rsquo;s drawn from the years of my life&rsquo;s journey. I hope you enjoy the book. More importantly, I hope this powerful question becomes a permanent part of your decisionmaking process. If you have the courage to ask it, your heavenly Father will use this simple question to guide and protect you in the days to come. And as you experience the significant difference this question makes, I think you&rsquo;ll agree that it&rsquo;s one you&rsquo;ll want to keep asking for the rest of your life. 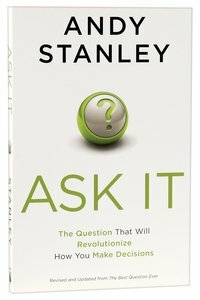 Customer Reviews For "Ask It!" The heart of this book is actually about seeking and attaining a heart of wisdom. Questions always lead us to outcomes; but are do we know where we are headed? Internal private decisions will have an impact on both the private and public sphere, whether we like it or not. This book speaks plainly about going after God's wisdom, knowing godly people we can turn to. especially when we don't know the answers. It's a good book to tune in to. The author of this book is a little bit coy at first about what the one question we need to ask is. The idea is deceptively simple: "What is the wise thing for me to do in this situation?". Without giving too much away, he proceeds to divide this question into three other questions that help the reader to gain the perspective they need on their situation to make the wisest choice. However the greatest value of the book in his illustrations of how asking these questions work in practice, drawn from his personal and pastoral experience, especially how a sequence of seemingly innocuous choices can predictably lead to sin and how making a pre-commitment to not making these innocuous choices can prevent a lot of heartache and regret. This is a book that would make a good gift to a teenager or other young person setting out in life since the core principle is simple enough to be easily applied, but deep enough to provide worthwhile guidance.